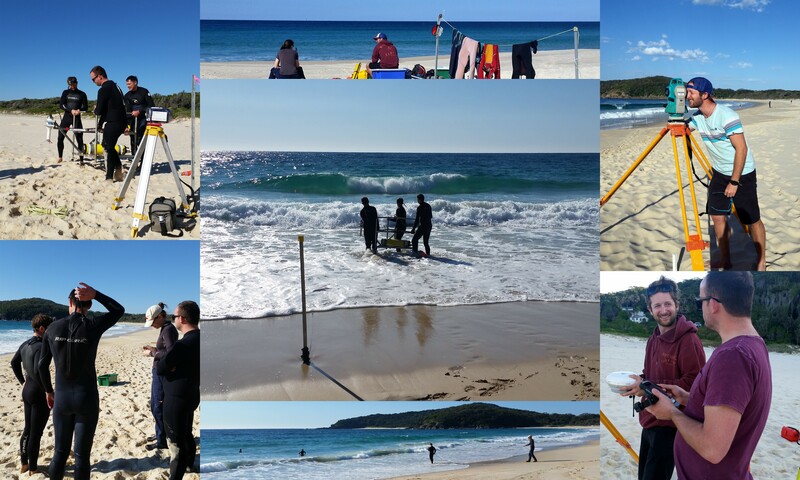 Over the last week researchers and students from Newcastle, Queensland, and Sydney Universities have been conducting experiments on beaches just south of Forster, New South Wales. The field work is funded by former GRG member Hannah Power (UoN) with the GRG and USyd providing equipment and personnel (Daniel Harris and honorary associate Michael Hughes). The field work has involved the daily deployment of pressure transducers (for measuring waves) and current meters, videoing the surf and swash zone and general beach surveys. The main focus of this field work is on the nature of wave transformation through surf zones and into the swash zone. After a few years absence it’s great to return to the beach and get some new data, particularly for the GRG which was the original birthplace of coastal morphodynamics (then the Coastal Studies Unit (CSU)). The group will head down to the South Coast of NSW to Gerroa to collect more data in the next few weeks with additional GRG members to join at later dates.